My son turned one last week. For his birthday I came up with these monkey cupcakes. I frosted the cupcakes with chocolate frosting and used Nilla Wafers for the face and mini Nilla Wafers for the ears. The eyes are made from mini marshmallows. I used a black jell pen for the nose, mouth and eye centers. It was very simple and I'm pleased with how they turned out. My three year old had a bast helping me and creating her own monkeys too. Those are so cute and so simple! I love them! I totally love this idea! I think I could even make them successfully. I thought for half a second about making monkey cupcakes for Spencer's birthday, but then I gave the idea up. These would have been perfect!! My 10 year old daughter wants a "monkey" birthday party. These might just be what we serve the guests and the birthday girl herself!!!! How cute!!! My son turns one in a few weeks. I was planning on doing an ocean "ONE"derland but I may have to reconsider. These are just too adorable to pass up. No birthday until spring at our house, but I got cake mix on sale at the grocery store last week so we're going to have to try these just for fun! Thanks for sharing! Darling. And simple. Love all the ideas you gals share here. Thanks! 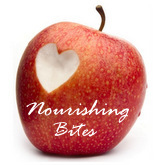 Thanks for linking up at childmade.com! You have wonderful ideas (I had even already linked a few myself.) 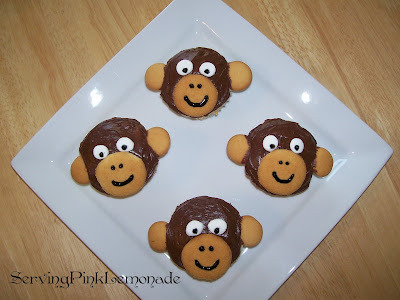 I especially like these little monkey cupcakes! Feel free to add more as you post. Thanks for sharing! I will be highlighting this on my Friday Faves tomorrow.